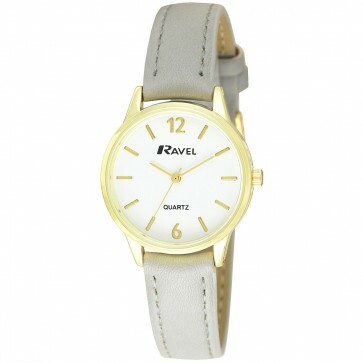 The Ravel Ladies R0133 watch is a classic. With it's faux leather strap and minimal index dial the R0133 combines basic style, functionality and comfort. This Ravel classic strap watches are packed in a clear Ravel hanging pouch with guarantee card. Polished Round Gold Case - 30mm.